Class B Motorhome: Its a Van, its a camper, its a VAN CAMPER. Class B Motorhomes by Roadtrek are the best selling van campers since 1990. Class B motorhomes are fuel efficient, easy to drive and park, and are very versatile. 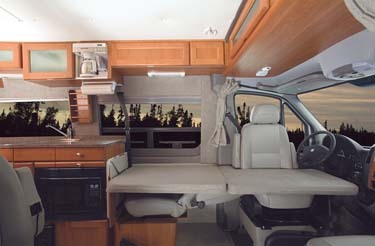 This page includes Class B Motorhome interior photos and descriptions along with a list of class B motorhomes for sale. Roadtrek Class B Van campers are the finest class B motorhomes on the market. Interested in seeing how Roadtrek got started? Check out the this vintage Roadtrek Brochure of a 1978 Roadtrek Motorhome. Roadtrek is the van camper that does it all. 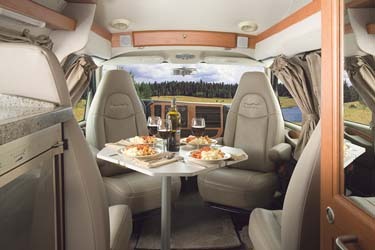 With your Roadtrek 190 Versatile, when its time to dine you have seating for four. The Roadtrek's driver and passenger seats rotate and with the use of the removable clover leaf table your van camper can comfortably seat four people for dinner. Roadtrek even has enough room for the kids! The Roadtrek 190 Popular has sleeping for three, while the Roadtrek 190 Versatile has sleeping for four. This picture illustrate the use of the optional folding mattress. Roadtrek's front driver seat and the rear seat are used together to make the bed. Roadtrek motorhomes have the the features of a much larger motorhome in vehicle small enough to drive everyday. 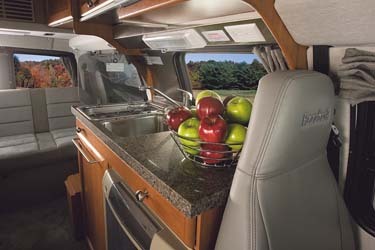 Roadtrek van campers feautre a Granite like counter-tops that rival luxury motorhomes of various shapes and sizes. 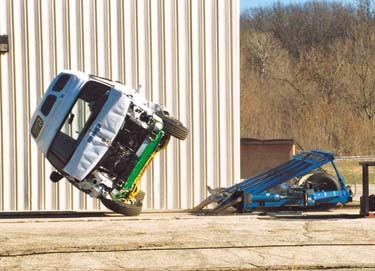 Testing - The only RV manufacturer conducting extensive durability testing where they put the equivalent of up to 120,000 miles! Your safety is important to Roadtrek! Can you take a shower or use the toilet in your Van? 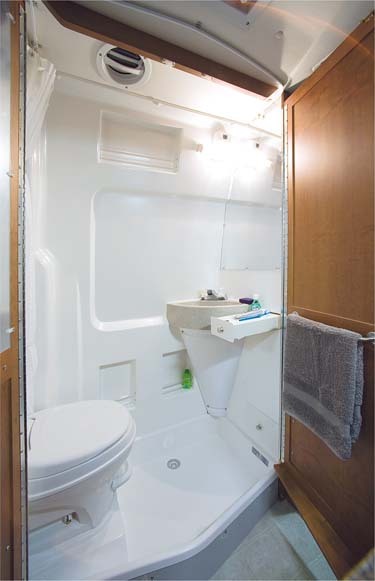 Roadtrek motorhomes feature a fully functional bathroom and shower. No need to find the nearest rest stop when you are traveling with your own. Safe, convenient, and clean. Your Roadtrek has hot water, its own fresh water tank, holding tanks, microwave, refrigerator, and more. 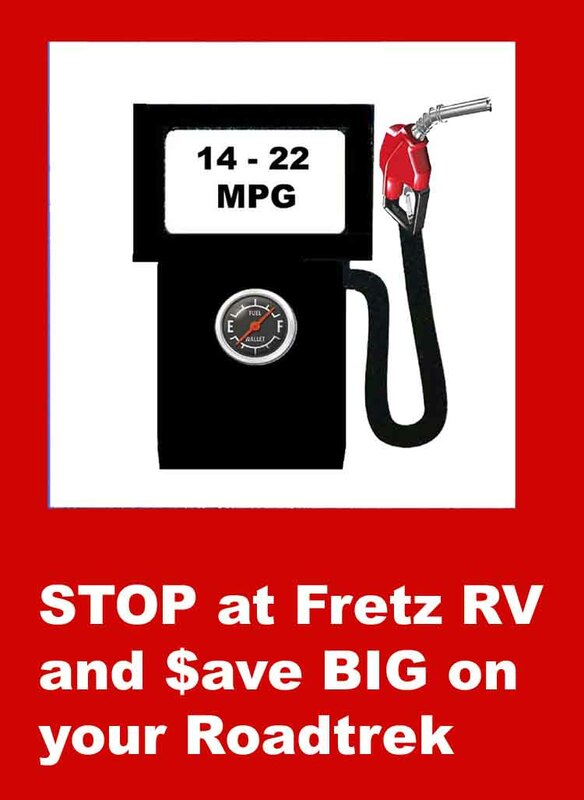 Fretz RV has specialized in class B and class B+ motorhomes since 1988. We have the knowledge and expertise to make sure your class B shopping experience is a pleasant and informative one. Have more questions about class B motorhomes? We'd love to help! Roadtrek offers BIG storage in a small package. 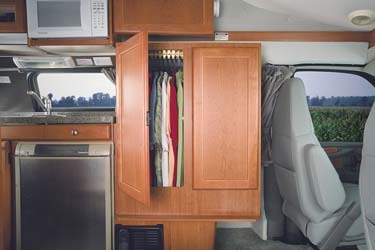 Roadtrek has cabinets, closets, wardrobes, drawers, doors, and compartments. You have plenty of room for your camping "stuff" whether you are staying for a day, weekend, or week. Roadtrek: The fuel efficient class B motorhome you can drive EVERYDAY!